How did it get to be Tuesday already? Time really flies these days. But in a good way–Spring is sort of springing (although I’m sure another cold front will wing through any day now). And while I still have some snow in the shady parts of my yard, I already have crocuses! Two little yellow ones are poking their gorgeous and oh-so-welcome faces through the garden and I’ve never been so excited to see some flowers in my life. But back to Richmond. After Saturday’s adventures, the Photographer, my uncle and his new wife, and I collaborated on some pizzas (which I forgot to take pictures of). We used Jim Lahey’s no-knead pizza dough recipe for the crust and, while I was suspicious of the lack of kneading, it turned out great! We got a crispy, chewy, baked all the way through delicious crust. And my uncle, a chef, whipped up the most fabulous sauce which, of course, has no recipe, but featured tomatoes, oregano, basil, red wine, and my all time fave aleppo pepper, among others. I loaded my pizza up with garlic, onions, spinach, red peppers, and mushrooms and the combo was super super tasty. The next day, Sunday, we all brunched at Ipanema and it was everything everyone said it would be. My uncle ordered the The Rhorer, a plate of toasted foccaccia bread with olive spread, roasted red peppers, melted cheese, and poached eggs, Priscilla (his wife) ordered the biscuits and gravy (which were oh so good), the Photographer ordered the day’s special–whole wheat walnut (I think) & banana pancakes with a cinnamon sugar Earth Balance spread–, and I ordered the Tempeh Benedict: an english muffin topped with smoky grilled tempeh, sauted spinach, mushrooms, tomato, and a citrus bernaise sauce. All dishes came with sweet potato hash and fruit, and I ordered, in addition to coffee, a tasty Bloody Mary. Thoughts: the dishes I tasted (the biscuits & gravy, my tempeh benedict, and the pancakes) were super delicious. I personally loved the hash, but The Photographer thought the dice was to small and cooked the sweet potatoes too much–no softness. My Bloody Mary was good but lacked the usual snacks (olives, celery, etc). I kind of missed the accoutrements. The staff was delightful and our food came quickly enough, and although I didn’t get to experience any of the amazing vegan pies, I will next time. And I’ll have to go back for lunch or dinner–their entrees look amazing! So that wraps up this month’s trip to Richmond and while I miss the great vegan restaurant food, it’s good to be home! very awesome on the no-knead pizza bread being such a tasty sucess. i’m gonna have to check that out and make it for dan. i’m so super glad you all enjoyed the brunch at ipanema. i’m with The Photographer in that i think the sweet potato hash is diced too small and could be more crispy/firm, and i do love celery and olives in my bloody marys (i would miss them as well), but the tempeh benedict = my fav, and i’m gonna tell dan that the biscuits and gravy were rock’n. last time we went he was only mildly impressed with his breakfast burrito. i love that he’s gotten to be such a food critic – it cracks me up. especially when it comes from a guy who when we first met only ate taquitos, chicken nuggets, and frozen pizzas. ha! 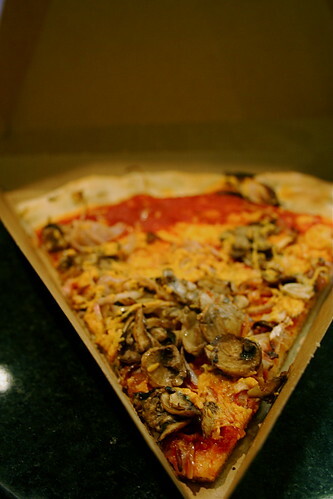 sadface on the grumpy whole foods guy, but that’s rock’n that they had vegan pizza! i have yet to make it to REI, but i have a feeling i’m gonna have to super soon. also – hoooooray for triathlon awesomeness. keep us posted on your training; i’d love to read about it, Jes! 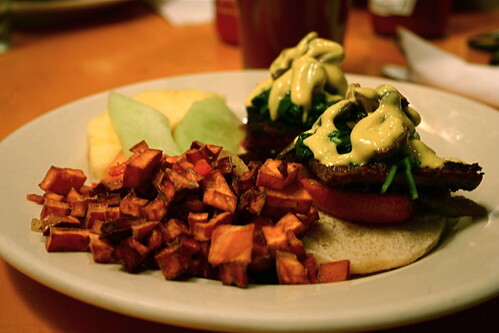 Looks like an excellent weekend – that Tempeh benedict is mighty appealing. I wish I had the recipe. Mmm, pizza! That benedict looks great! Yay for spring! My WF here in Cambridge is now selling Daiya shredded in the deli department with the pizza fixins and in the section with the tofu/meat analogs in typical WF deli containers..maybe if there’s a WF near you can you find it there too. Mine has the orange cheddar but they also sell a white italian blend which I like better. It melts really well and crisps up like cheese but I am iffy on the taste. I think I like FYH cheeze better but the melting qualities of Daiya are amazing! What a fun, food-filled weekend, Jes. 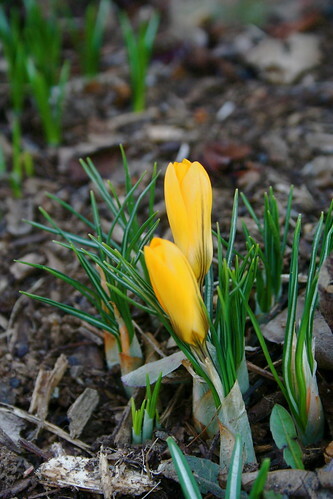 I’m with you when it comes to spotting the first crocuses – it’s such a thrill! I literally swoon over them. Mine are trying real hard to pop through, but still have a ways to go. Thank the goddess for the early snowdrops that have been putting on their show already. Spring is springing for sure. Love the first signs of natures colouring book. Sure looks like you had a fabulous weekend.